I was in the 12th grade. One of the most crucial year of any student’s life. College had recently reopened. I was filled with excitement, yet worried. Worried if would be able to make it. Worried if I would get a seat in one of the best medical school. Worried if I would live up to everybody’s expectations. It started off as a regular day for me. I got free from college earlier than usual, as a few lectures got cancelled. As it was the onset of monsoon, the weather outside was pleasant with light and occasional drizzle. Just one of those perfect days, when you would want to go the nearest cafe, and enjoy a perfect cup of coffee over random conversations with your friends. Unfortunately, a friend of mine was adamant of not letting this happen, as she wanted to go and buy a cellphone. Buying a cell phone wasn’t the problem. She wanted to go buy it from a specific store in Irla, Vile Parle. I tried to argue(d) with her saying how it’s stupid to travel to the other part of the city buy a cell phone. But, in vain. Finally, I gave up and agreed, thinking I would at least get to spend time with my friends. So, the four of us took a train from Wadala to Vile Parle. By now, it had become sort of a mini-picnic for the four teenagers, as we were not used to travelling so far. Little did we know, we weren’t prepared for how the day was to unfold. We reached the place, bought a phone, ate in a jiffy and headed straight to Vile Parle station. The train was relatively empty and we were standing comfortably by the door, enjoying the greenery on both sides of the track and talking away in glory.. Just then, we hear a loud noise. And immediately, the train halts, between two stations. Everyone starts wondering, was it some huge cracker? Or was it some noise from a nearby factory? Nobody could even guess, that it was bomb. I peeped outside the train, and on one side, I could see a couple of trains that had halted, just like ours. And on the other side, I could see Khar station. We were approximately 0.5 kms away from the station. It had been almost 5 minutes since the train halt. By now we had heard the dreaded word, bomb, a couple of times. But nobody was sure about anything. We heaved a sigh of relief, when our train started, only to be disappointed again. The train went ahead and halted at Khar station, and it wasn’t going to go ahead. Yes, we still weren’t 100% sure that it was a bomb blast. We got out of the station and tried to find a bus that would take us home. Every single person on the street was discussing the same thing. We had no option but to believe, that it was indeed a bomb blast. The phone networks were jammed by now. The roads were jammed with vehicles and groups of people who were trying to find their way home, as the life line of Mumbai came to standstill. The train services were stopped for a few hours. The blast that we heard (witnessed), wasn’t the only bomb blast. There were 6 other blasts that followed it. 7 bomb blasts within 30 minutes. Hearing that, shook us. If, for a 16 year old, being stranded on the road in a completely new part of the city, wasn’t disturbing enough, we hear about 7 bomb blasts. In my mind, I really wasn’t sure if I would reach home that night. I was only thinking about my parents’. I knew they would be scared and worried by now and there was no way to inform them about my location. After about 3.5 hours of struggle, a bus, rickshaw and a cab commute, I reached home. My mom was in tears when she saw me. She had been consistently trying to call me since 4 hours, in spite of knowing that the phone networks were jammed. I was too shocked to express or say anything. But I put up a brave face and didn’t cry, so that she would stop crying. I was obviously relieved that I had reached home safely. The news was ON and I sat in front of the TV, besides my parents’. They were showing glimpses of the train compartments, the injured people, the shattered and blown apart body parts, the dead bodies lying on the tracks, blood. I couldn’t believe that I was right there, when all of it happened. As thankful as I was for reaching home safely and being #together with my parents’, my heart went out to thousands of those, who had lost their loved ones on that dreaded day, who didn’t even know that they were seeing their father/ mother/ child, for the last time, that morning. My worry of not getting a seat in one of the best medical schools, seemed like such a minuscule and trivial need after this incident. I was numb. So today I was helping this friend of mine with creating a blog for her, and in the process, I started sharing links of all the blogs I follow and/ or particularly a few posts that I’d read and liked. That’s when I was reminded of this post (link mentioned below) again, amongst others, because I thought she would really connect to it. Not to my surprise, she did and also loved it. Thought I should share the awesomeness with all of you as well. So, here it is. The Best Kind Of Guy Friend. P.S. – This post is also dedicated to the only such guy in my life, who I call my best friend, Manish Ahuja. The first time I saw this book, was at Anubha’s place and I immediately started reading the summary on the back cover. The amount of enthusiasm with which I’d picked up the book was inversely proportional to what I understood after reading the summary, because frankly I knew nothing about Chanakya. Why only Chanakya? I hardly know/ remember anything about Indian history. That too, of 2300 years ago, when India was called Bharat. I mean, really, who wants to know how was life back then? Certainly, historical fiction was one genre I hadn’t tried my hands on, ever. So, I was really skeptical about registering myself in the ‘Book Review Program’ at BlogAdda.com. I’d almost made up my mind against doing so, as I thought, I wouldn’t understand anything and therefore, won’t be able to do justice to my review about the book. That’s when Manish Ahuja said, “It’s the author’s job to make you understand what is the book about. Yours, is just to read”. I couldn’t agree more to what he had to say, whereas I still wasn’t sure if I could pull it off. Somehow I convinced myself, registered and I’m so glad I did. The author, Ashwin Sanghi, did what a good author is supposed to. 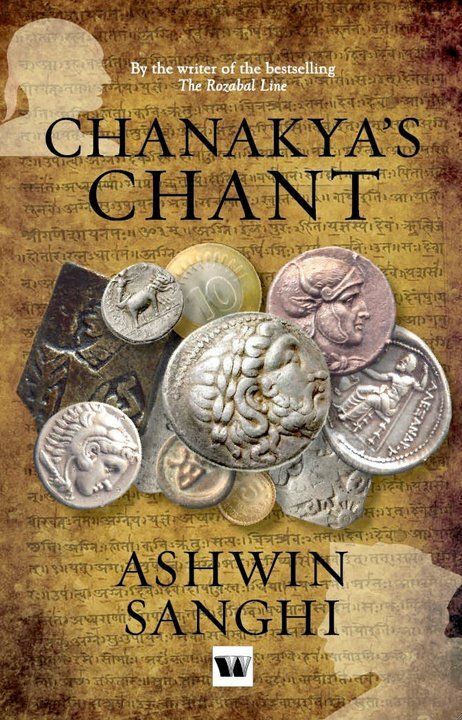 Chanakya’s Chant is one of those intuitive and awe-inspiring novels I have read so far. The book runs parallel in two plots: one which was set 2300 years ago, the story of Chanakya and his protégé Chandragupta; and the other which is about modern India, the story of Gangasagar Mishra and his protégé Chandni Gupta. While the first story is a fiction revolving around an actual person, Chanakya, who manipulates people with his ruthless strategies; it is the story of Gangasagar Mishra what makes the book, that it is. It is how, the author has weaved the story of Gangasagar Mishra in the modern day India will make you fall in love with the book even more, and rightfully so, because we relate to the circumstances and the characters better. Though Gangasagar Mishra did the same thing as Chanakya, which was manipulating people to reach his ultimate goal, there was a huge difference in the way he did it. The circumstances were different, so were their ways to tackle the obstacles and get things done their way. How was Chanakya’s strategy different from Gangasagar Mishra is for you to find out. Not giving away any spoilers. Talking about the writing style of the author, as mentioned earlier, the story runs parallel in two plots which (I think) has it’s pros and cons. While this style helped to understand both the stories and the similarities in ’em better, it also made it very easy to get lost and confused in the midst of so many characters. Speaking from experience, I myself lost track of the story at one point in the middle of the book, and I had to go back to the end of the previous chapter of the same plot to connect the dots. I wouldn’t actually call this a con, because it eventually depends upon the reader and his/ her concentration and dedication towards the book. So yeah, if you think you would like to read this book just for passing time, refrain. Otherwise, it’s a must read. It will definitely keep you hooked from start till the end. I remember, when I was just 100 odd pages into the book, I was so impressed by the author, his immense knowledge, his way of depicting a brilliant story, that it is, I instantly decided on reading ‘The Rozabal Line‘, the author’s first book. Can’t wait to read and probably write a review too. I cannot stop recommending this book to all the people I know. The book is definitely going as one of my favorites on my shelf in Shelfari. For all those who are still not sure about giving this book a try or not, watch this YouTube video which would give a clear view of the book’s theme. Feel free to share your views about the book. Suddenly, this song makes so much more sense. Some songs keep you sane even in the worst of situations. This is just one of those songs. You know that ‘extremely-happy-for-no-reason-at-all’ feeling? Yes, that. That is exactly how Iam feeling right now. I feel like I am on cloud nine. I just can’t stop smiling which is making me feel like a complete idiot. 😀 I have been listening to my old playlist of songs for quite some time now which has taken me into a completely different world. Even the most disturbing songs couldn’t take that smile off my face. Weird, eh? I know. I myself am wondering that is this even possible? Have I gone mad or something? I swear I am not high. 😀 I want to talk and talk. Just talk to someone and explain how I am feeling right now. Though I know I wouldn’t be able to explain. Words are not enough to explain what I am feeling. Missing two people so so much. I wish they were right here or at least I could talk to them. 1] My brother, Ankur – It’s his birthday today. I want to hug and tell him that I love him and miss him a lot. Yes, I have my exams in 18 days. Major fml! I should better go study, no? Yes. Thank you! 1. I think about people (read: friends and loved ones) way before I do about myself. 2. I expect. Not much, but I definitely do which I think comes naturally and unknowingly. 3. I am irritatingly understanding (blame it on the truckloads of patience that I have), as Manish had once quoted. Now I kinda totally agree with him. 4. Being all of the above is not always good. 5. I need to stop being all of the above. Like, seriously. I’m standing at the point where I know, which bridges to cross and which ones to burn. Almost. Yeah. So, yay! Plant trees – Go Green!